295 pages | 189 B/W Illus. A hands-on guide to adapting Lean principles and the Toyota Production System to high-mix/low-volume environments, Lean Production for the Small Company uses charts, pictures, and easy-to-understand language to describe the methods needed to improve processes and eliminate waste. It walks readers through the correct order of implementation and describes problems and pitfalls along with time-tested solutions. Explaining how to incorporate existing systems into a Lean strategy, the book starts with the fundamentals and builds on them to describe the full range of tools and processes needed to implement Lean. It outlines how to design factories for Lean manufacturing and demonstrates how to remove variations within business and manufacturing processes to achieve a smooth continuous flow of product that delivers your product on time to customers. The tools, methods, and ideals discussed are applicable in any industry and all parts of your business—from manufacturing and sales to human resources. The text unveils new methods and tools that can help you reduce inventory, improve inventory turns, and facilitate raw material flow through the factory. It details how to use customer order demands to schedule the production floor, rather than using estimated production schedules. It also considers the accounting process and explains how to improve your cash-to-cash cycle time. Drawing on the author’s decades of experience transforming high-mix plants to Lean, the text brings together coverage of the tools and processes that have made Toyota so successful. 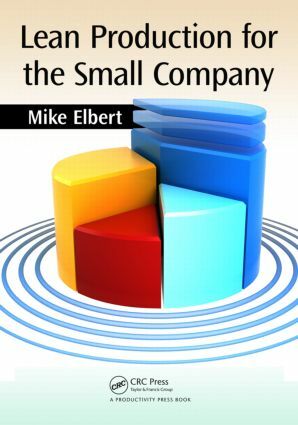 All the chapters in this book, when implemented, will result in a culture change that will transform your company into a learning organization that continuously eliminates waste and improves its processes. What Finished Goods Should I Stock? How do I Expedite Parts? Coupled versus Decoupled Routes (What’s the Difference)? Where Do You Start Error-Proofing? Where do you Find People with Lean Business Knowledge? Mike Elbert is president of Elbert Lean Business Systems, LLC, a consulting service that helps businesses eliminate waste. A qualified Lean Practitioner, Mike is a leader in business and manufacturing processes and systems with an MBA in manufacturing systems from the University of St. Thomas. Industries that Mike has worked in include electronic components, consumer electronics, heavy metal fabrication, precision machining, plastic and rubber molding, and medical device manufacturing. He spent more than twenty-five years as a manager of engineering, quality, product, and process design, and he understands the importance of planning, teamwork, and accountability. During his thirty-plus years in manufacturing, Mike has worked in a diverse range of organizations, including small-, mid-, and large-sized corporations. For the past twenty-five years, he has worked with Lean manufacturing systems and its predecessors, focusing on improving manufacturing processes and equipment. Mike believes that any business, including start-ups, can improve efficiency and income by identifying and eliminating waste from processes, including the extended supply chain. He offers a range of programs and services that include teaching Lean business systems, facilitating improvement meetings, and directing the overall transformation of your company to a Lean organization. Drawing on decades of experience in low- and high-volume production, he now focuses mainly on the implementation of Lean business and manufacturing systems while also providing many classical industrial engineering products. After a career spent reducing costs and improving manufacturing efficiency, Mike now teaches and coaches others on how to achieve the same success. He is passionate about Lean business and manufacturing systems and their ability to improve your company, products, and customer satisfaction. Mike has published articles and has been quoted in Industrial Engineeringmagazine, and was a columnist for the Minnesota Manufacturers Alliance’s monthly newsletter. He has taught seminars for the Minnesota Manufacturers Alliance, Minnesota Employers Association, and nationally for the Institute of Industrial Engineers. He is a life member of the Institute of Industrial Engineers and a member of its Twin Cities Chapter 38. Mike Elbert is available for private consultations on Lean Enterprise Systems, operations management, industrial engineering, and facility design. For more information, please visit his website at www.elbertleansystems.com.